From tubby tabbies to giant gingers, obesity is becoming a big problem for the UK’s cats. It’s thought that almost half of the nation’s moggies are overweight, but with all that fluff padding them out, it can be difficult to notice how their bodies are changing. 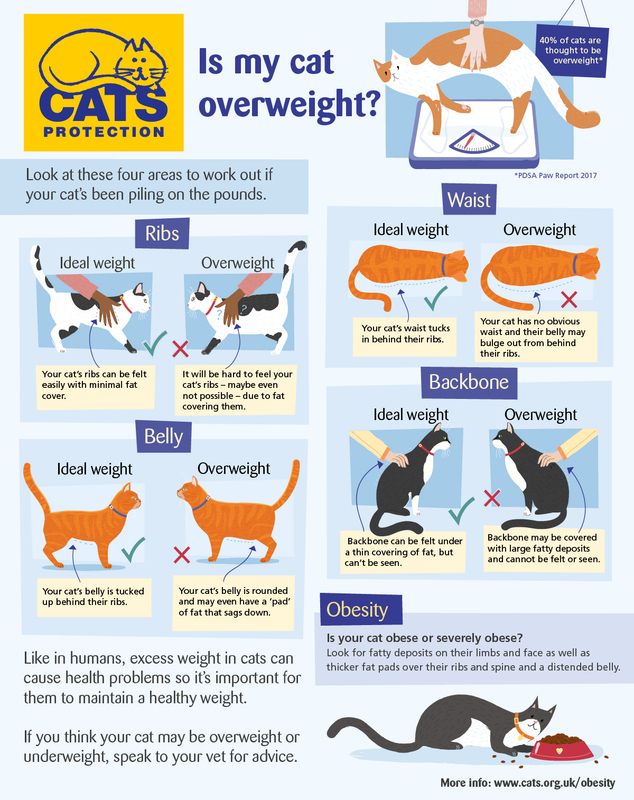 If your cat is overweight, this can increase the risk of them developing many different health conditions, including diabetes, osteoarthritis and heart problems, so it’s important to tackle the problem as early as possible. However, it’s also vital that they shed the pounds slowly as rapid weight loss can lead to further health issues. Speak to your vet to work out an appropriate feeding programme but be prepared that it could take up to a year for your cat to reach their ideal weight again!